What is a “sailtrack banner”? The clue is in the name. It uses a normal banner as the face of a sign, much like a billboard. To keep it tight, the skin is stretched using sailtrack. Sailtrack is an aluminium channel which is extruded with a C-section and a flat bar attached. This allows us to slide the rope edge of the banner into the track and then fix the track to a wall, fascia, awning or any other flat surface. The beauty of sailtrack banners is they can be used as signs, but at a far cheaper cost than a metal sign. You get the vibrancy and punch of a large sign without the expense. 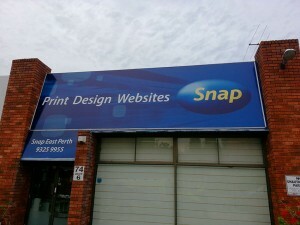 Seen above is a large sailtrack banner skin with printed and installed for Snap in East Perth. If you need signage but are on a budget, then why not try a sailtrack banner? Head to our contact page to ask for a quote today!